Southwell Minster in the 1670s. But naturally of more enduring interest to the antiquary than the country seats is the work of the builders of old who have enriched us with noble churches in almost every parish. First and foremost of our ancient ecclesiastical edifices is the minster church at Southwell, rich in its reminiscences of great dignitaries, some of whom rest within the shadow of its venerable walls. That one of the earliest buildings in the land devoted to Christian worship was erected on this site, there is no doubt, and over its remains uprose by slow degrees the glorious edifice which now stands a noble monument to the piety and zeal of our ancestors. The principal Norman portions of the present fabric, nave and transepts, are said to have been built about 1110, during the archiepiscopate of Thomas II., the namesake and nephew of the first Norman Archbishop of York, Thomas of Bayeux. In the Registrum Album is an undated letter, written by an Archbishop Thomas, soliciting alms to defray the cost of the building. It is believed that this missive emanated from Thomas II., an opinion which receives confirmation from the style of the masonry being of a more compact and finished character than that of an earlier date. In searching for materials for the life of this eminent Archbishop, Canon Raine found few traces of him in the domestic affairs of his diocese. He is known, however, to have obtained from the King a grant of privileges to the church at Southwell, and to have freed the Canons and their church from the claims and exactions of himself and his successors. The effigies and sepulchral slabs include a fine monument to Archbishop Sandys, and a slab formerly in the floor of the choir to the memory of William Talbot, a Canon of Southwell who lived in the fifteenth century. Immediately adjoining the church are the remains of one of the famous palaces of the Archbishops of York, of which one of the great apartments—the hall—is standing in the north-west corner of the quadrangle. This has been renovated and restored under the direction and through the liberality of that eminent antiquary, Dr. Trollope, Bishop of Nottingham. We may add that Southwell has been fortunate in its historians, a large volume having been written by Mr. Dickinson, a smaller one by Mr. Shilton, a third by Clark and Kilipack, and recently a very interesting little work by Mr. Grevile M. Livett, B.A., in which the dates quoted above are assigned. Of the principal parochial churches there are several that deserve special mention. The chief ecclesiastical edifice in the county town is the Church of St. Mary which, from its commanding position, is a conspicuous feature. It is a cruciform building, very spacious, and of elegant Perpendicular work, comprising chancel, nave, transepts, north and south porches, and a central embattled tower of two stages with pinnacles. St. Peter’s Church is also mainly in the Perpendicular style, though there are portions of Early English work in it. St. Nicholas’s church was rebuilt in 1671. Other remarkable features in Newark Church are the magnificent chancel screen made about 1508, the old font rebuilt in 1660, the famous Fleming brass, one of the most splendid remaining in the kingdom, to the memory of Alan Fleming, who died in 1361, and a very much smaller and less ornamental brass to William Phyllypot, who died in 1557. At Blyth there are the remains of a very fine edifice which united both a monastic and a parochial church under one roof. In its original form it consisted of a nave, side aisles, transepts, central tower, and choir, terminating in an apse. Although much of this venerable church remains, yet much has been destroyed. 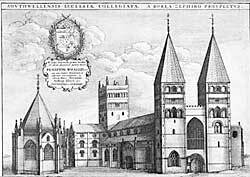 The conventual choir, where for over four and a half centuries prayer was daily wont to be said, the central low Norman tower, and the transepts, have been swept away. The Rev. J. Raine, the historian of Blyth, believes that the Benedictines immediately after their original foundation, AD. 1088, commenced with a Norman apse, and proceeded consecutively with the choir, transepts, central tower, nave and aisles. The existing portions of the north aisle, with its rude vault of rubble, of the nave with its round arches, massive piers, cushion capitals, triforium, clerestory and corbel table, and of the south wall and transept, all harmonize with this date. The first change which the church, thus constituted, underwent, was the substitution of an Early English groined vault with moulded rib and elaborate bosses over the nave for the original roof of wood. This was about 1250.Next came the expansion of the narrow Norman aisles for the purpose of forming a parish church, and not long after this the south aisle was widened. Henceforth the convent and the parish each possessed its own chancel, which in process of time were defined by two separate rood-lofts in a line with each other crossing the nave and south aisle. The latter of these screens remains. The next change which the church underwent was the construction of the present tower about the middle of the fifteenth century, and no work of any importance was done after it. The church is a very interesting one, and will well repay inspection.